This acronym, meaning “President of the United States”, has been common among Washington insiders for several decades. It has spread far wider in recent years, even outside the US, as a result in part of TV programmes like The West Wing. It has to be said it’s a pretty obvious abbreviation, one that must have occurred to many people down the years. But we’re sure its genesis lies with Mr Walter P Phillips, a former journalist and telegraph operator who was at the time the Washington bureau chief for the Associated Press but who later became General Manager of the United Press Association and a vice-president of the Columbia Graphophone Company. 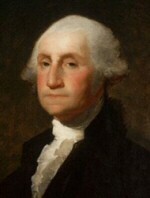 POTUS One, though nobody could have called George Washington that. Mr Phillips published his code in 1879. At first it was primarily valued to streamline the reporting of court proceedings but was soon extended beyond legal matters to news in general, and would have been known to everyone dealing with copy coming in on the wire. It was a shorthand for terms that were likely to appear in news reports: fapib meant “filed a petition in bankruptcy”; ckx, “committed suicide”; utaf, “under the auspices of the”. One or more letters may mean one word, or may mean a group of words. For instance, a dot, dash and a dot, or the letter f, means “of the;” potus, “president of the United States”, xn, “constitution”, and hundreds of others, which, when sent at a high rate of speed, keep an operator’s attention constantly riveted on every dot and dash in order that he may transcribe the conglomeration, on a typewriter, into reading matter such as appears in the daily newspapers. The Birmingham Age-Herald (Alabama), 14 Apr. 1895. SCOTUS was in the code when it was first published. (FLOTUS, for First Lady of the United States, is both much more recent and less common.) As a result, both it and POTUS can lay claim to being among the earliest known acronyms — with SCOTUS winning by a short head — both of them long beating AWOL, Absent Without Leave, which press reports show was being said as a pronounceable word around 1918. Last modified: 17 April 2011.